BELLEVILLE – Over 90 toys have been donated to the 12 Days of Giving: Student Versus Staff event at Loyalist College in support of the Belleville firefighters’ toy drive. 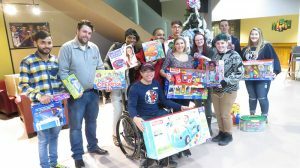 Kevin Bazkur, a public relations student at Loyalist who has organized the event, says staff are winning the friendly competition with 60 items donated to the toy drive, while students have donated 30 items. Puzzles and sports equipment are among the donations. He’s happy with the level of participation, he said. Members of the student government with their donations to the toy drive in the Shark Tank Pub. Photo via the Loyalist Life Facebook page. The Loyalist student government has donated $500 worth of toys and gifts, according to president Scott Rook. This is a yearly donation for the student government, he said. The donation included a lot of brand-name board games, including Operation, Rook said. Bazkur says there is still a great need for toys for girls ages seven to 10. There is still time to donate; the competition goes until Friday. The final count will be announced by the Loyalist public relations students on Monday.